A few weeks ago, Google announced that it had teamed up with a mental health advocacy group to take a stab at addressing the American epidemic of depression. 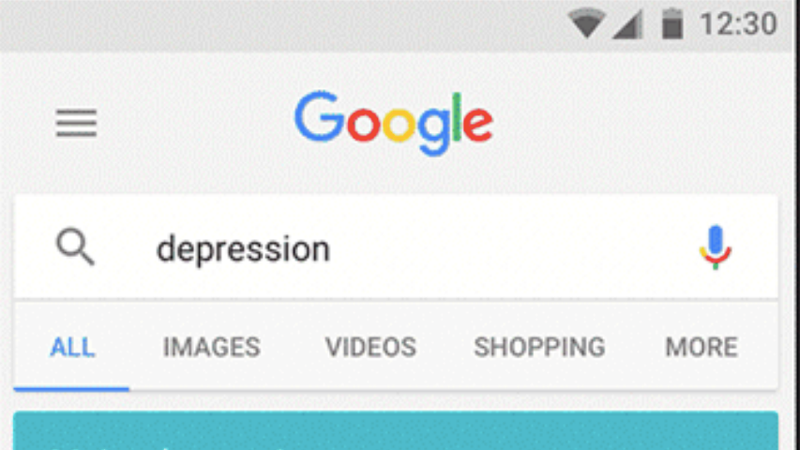 People who type the words “clinical depression” into Google search via mobile in the US are now presented automatically with a link to a screening questionnaire to assess their depression. The assertion that Google has the answer to everything just got taken to a whole new level. Google is not the only company hoping there may be some digital solutions to the problems of mental health. Apple recently posted a job application for programmers with psychology and counseling backgrounds in order to turn Siri into a better therapist. On Thursday, the Food and Drug Administration approved the first mobile app for treating substance abuse—an app from Pear Therapeutics originally designed to be prescribed by a physician. The pharmaceutical company GlaxoSmithKline inked a deal to create a “digitally guided therapy,” one of many such ventures in the growing “digital therapeutics” space hoping to move health apps beyond wellness trends. A small contingent of experts, though, is arguing that asking Google to diagnose depression might be taking things too far. The patient health questionnaire offered by Google is a screening tool used by doctors to test a patient’s level of depression. For those with high scores, Google will offer links to materials from the National Alliance on Mental Illness and telephone helplines. The end goal is to drive higher percentages of people to seek treatment for depression. Gilbody raised concerns about inadequate treatment resources that Google offers its users. “Google’s initiative has been reported positively and uncritically despite bypassing the usual checks and balances that exist for good reason. It is unlikely that their initiative will improve population health and may in fact do harm,” he wrote. John Grohol, a psychologist who runs the website PsychCentral, also said the move raises red flags, especially when it comes to questions of user privacy. While Google, Siri or some other app will not replace the need of a visit to a doctor’s office any time soon, these new developments offer a step towards technology products that do a better job of recognizing the complexity of human emotional needs. This is a big improvement. And just maybe, clinical psychiatrist Ken Duckworth wrote in BMJ in defense of Google, such initiatives can raise awareness and help more people seek treatment. Just don’t expect Google to hand you a tissue.